New York gun laws: 10 will get you 7….or something like that. New York, ah New York, the city so nice they named it twice. Good thing nice was the standard. If smart legislators was the standard their name might have been Dumber and Dumberer. To be fair, (an uncommon occurrence here at Unfiltered & Unfettered), it’s New York State in the cross hairs today, not just the city. Oh, in the cross hairs, are we still allowed to say that? Ah well, send your complaints to Tony Hupp at …. Gov. 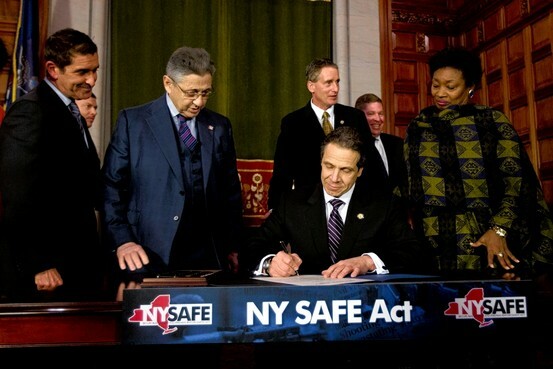 Cuomo signs the SAFE Act. So the Governor of New York, Andrew Cuomo (D), a definite 2016 contender if Hill-Dogg doesn’t run, has signed into law the Secure Ammunition and Firearms Enforcement Act, which among other things, limits the number of rounds in a clip to seven. In case you were wondering the number of guns manufactured with a clip holding less than ten rounds is miniscule. I’m a dope when it comes to the mechanics of this discussion. In the Air Force they told me the bullets come out the pointy end and I managed to hit the target enough to qualify to carry an M-16. So I went to a person I trust and consider an expert on the subject (a current police officer in my home state of NJ). After I schooled him on politics he schooled me on the gun law and how it affects guns and gun clip manufacture. Here is what he had to say. So even the police recognized the need for a larger capacity clip. That’s important because the police play a big role in this new law, but not how you might imagine. Read on people. Also, notice the lack of the term “assault weapon” in my friend’s comments. I have yet to hear a member of the military or law enforcement use the term assault weapon. Every gun is an assault weapon and no gun is an assault weapon. My spatula is an assault weapon if used with intent to harm. That does not include the eggs I burned the other day. There is no singular gun called an assault gun. Let’s go to one of New York’s own publications, the New York Magazine, for an explanation of the term assault weapon. Yeah you read that right, lawmakers have defined what we currently come to believe the term assault weapon means. Governor Cuomo has used that to great effect. His gun control measure passed quickly and almost unanimously. Republicans in the senate and democrats in the House both pushed the bill through fast and Cuomo signed it in two days with no press coverage He would later say he was trying to avoid a run on the gun stores if the public had known the bill passed and was being signed so quickly. Nice try Andrew. More likely it was to keep opposition guessing so they wouldn’t have time to mount a defense. They didn’t and the bill passed but may not stand. Here’s a few reasons why. 1. The law allows for a grandfather clause for those with 10 round clips, provided they only load 7 rounds. So if you’re baking brownies while loading your assault spatula and lose count, loading 8 rounds instead of 7, you’ll earn your first misdemeanor, maybe your second. Our readership is a pretty salty audience. Well who is gonna monitor all that. I mean the only way johnny homeowner gets caught is if 8 dudes invade his house and he closes out all 8 with out reloading. In simpler terms the law is incredibly cumbersome. 2. The law has no language, and makes no exemptions for guns used in official capacity. In short all New York police are now in possession of illegal weapons. That list would also include members working out of the New York FBI, CIA, NSA offices, not to mention the Secret Service whenever Pres Obama, Bush 43, Clinton, and Bush 41 come to town. The list goes on and on and on. Who wrote this freaking law? Whoever it was will get a second chance when the NY State or US Supreme Court calls the law unconstitutional. 3. Gun and ammo manufactures have already said they will not be making special clips to comply with the new law. Obviously it can’t be cost effective to make items for just one state, especially when it’s unlikely most will comply and the law may not stand. But gun manufactures decision not to make the new clips makes the law look like what it really is – an end around of the 2nd amendment. 4. Last and most obscure, it looks a little like forcing people to buy a smaller gun with a smaller clip could be considered collusion between the state and free market. If I were a conspiracy theorist (love those guys), I would start looking into state legislators business holdings and see who is tied into a gun or ammo manufacture, no matter how thin the connection. As I implied earlier, we here at Unfiltered and Unfettered are not always…. well never, we are never fair in our analysis. But in this case the law does address background checks and mental illness, sadly these good provisions will get thrown out with the bath water as this poorly written bill isn’t even good for target practice. 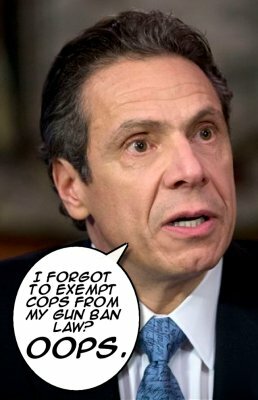 This entry was posted in Politics and tagged 7 round clip, clip capacity, Cuomo, NY Gun Law, SAFE Act. ← Gun Buy-backs and security blankets.